This may sound incredible, but it’s true. Editors, newscasters, foreign correspondents do not understand the real meaning of the world news they report, analyze and discuss. Heads of government are utterly unaware of the true significance of the very world-shaking events with which they deal. They have no conception of where these events are leading. Incredible? Perhaps—but true! About one third of that Instruction Book is devoted to basic education—revealing to man the necessary foundational knowledge otherwise undiscoverable and unknowable: knowledge of what man is, why he is, where his destiny may lead, how to reach it and live happily along the way; revealing knowledge of the true values as distinguished from the false; knowledge of the way to peace, happiness, abundant well-being. In other words, the most necessary of all knowledge—the foundation on which to build discoverable knowledge. Another approximate third of that Book is devoted to history—to those events and experiences fulfilling the master plan during the first four millennia of man’s mortal sojourn, as examples for our admonition and guidance today. And then approximately a third—grasp this!—an entire third of our Maker’s revelation to mankind is devoted to prophecy—writing the history of future events before they occur. These foretold future events reveal the great purpose being finally worked out—being brought to its completion. A rational and right knowledge of this great purpose, of the Creator’s master plan, of where in the progression of those foreordained events we stand today, and of major happenings prophesied yet to occur—this knowledge is the essential basis for understanding the significance and true meaning of today’s dynamic world news. Without this vital knowledge, none dealing in news gathering and news reporting, none responsible for government policies can understand current world happenings or where they are leading. And not one saddled with such responsibilities does know! Why? Two reasons, primarily: 1) They have been deceived by false education appealing to the vanity of intellect into prejudicial and disdainful rejection of the divine revelation which alone can impart this understanding; and 2) the vital key necessary to unlock closed doors of biblical prophecy had been lost. The colossal tragedy of it! Our peoples, being thus falsely and deceptively educated from little children, have, in a supposed era of advanced rationalism and enlightenment, actually been groping around in the darkness of ignorance, misunderstanding and confusion, fatally unaware of the earthshaking catastrophe into which they are being directly plunged. 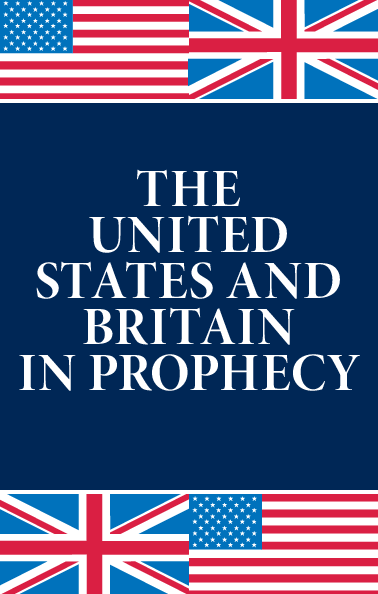 That key is knowledge of the astonishing identity of the American and British peoples—as well as the German—in biblical prophecies. This very eye-opening, astounding identity is the strongest proof of the inspiration and authority of the Holy Bible! It is, at the same time, the strongest proof of the very active existence of the living God! 20th century! It is a warning to us—to our English-speaking peoples—of immediate life-and-death import. The prophecies come alive once their doors are opened by this now discovered master key! This book will open, to open minds, this hitherto closed vital third of all the Bible. No story of fiction ever was so strange, so fascinating, so absorbing, so packed with interest and suspense, as this gripping story of our identity—and our ancestry. Through it Almighty God gives momentous warning! Those who read, and heed, may be spared unprecedented cataclysmic tragedy soon to strike. If our peoples and their governments will awaken, heed, and return to their living God, then our nations may be spared. God help us to understand! Continue Reading: Chapter 2: Prophecies Closed Until Now!